As an educator, and someone who works closely with kids and teens, this story was heartbreaking. We need to talk about pressure; we need to talk about what this pressure looks like in the lives of our students. “Not Just Another Suicide.” That’s the name of the article that talks about Patrick Turner, the sixteen-year-old from Newport Beach, California who took his own life. He was described as ‘seemingly happy-go-lucky,’ but in his note (below) he says he felt constantly stressed. A little background: his high school, Corona del Mar, ranks 413th out of 22,000+ high schools in the nation. He also lived in the fourth richest city in the United States. For a sixteen-year-old, that is an extreme amount of pressure to succeed. 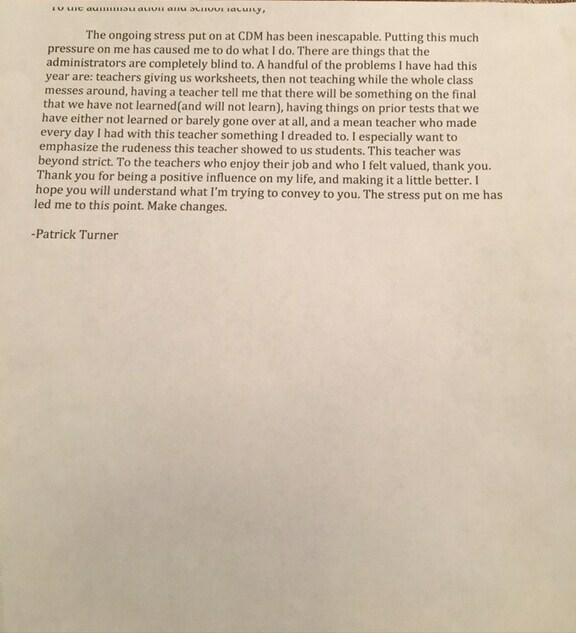 “The ongoing stress put on at CDM has been inescapable. He then gives examples of ways teachers had failed him or let him down, and the unpleasant experiences he had as a student – downright awful. This post hit me right in the chest. Not only can I relate to some of the struggles Turner experienced from my own childhood/education, but I feel such a personal responsibility to change the way classrooms operate. It is our job, as educators, to empower our students to exceed their potentials, but never to create an ‘ideal’ that they’ll never reach. Yes, we must push our students and not allow them to sit and be mediocre, but there is a big difference between inspiring and stressing, between having high expectations and making someone feel inadequate for not reaching them. Turner’s story is heartbreaking because it could have been avoided. No child, especially so young, should ever want to take his or her own life because of school. The classroom should be a safe place, a community, and an area that motivates and empowers, not breaks and causes inner turmoil. We need to step up. We need to change how our classrooms operate and make sure that our focus is on building students, while simultaneously reminding them that they were never incomplete to begin with. We need to show them what’s out there, and that there’s so much more than high school drama, GPAs, test scores, and college applications. We need to open our doors, to listen, to love on these young students as they go through the most difficult times in their lives. We must identify stress and find ways to fight against it. We must talk about pressure, and lift the burdens from our students’ shoulders before it’s too late. < Happy Teacher Appreciation Day! Here’s a SALE For You!